New satellite photos of North Korea reveal fresh details about the nation's space launch facilities, where preparations continue for the imminent, and highly controversial, flight of a long-range rocket. The photos, which were snapped by DigitalGlobe, a commercial provider of high-resolution Earth images, give a unique bird's-eye view of the new North Korean launch site, which is located near the northwest village of Tongchang-ri. "It's our assessment at this point that everything appears ready for a launch, and press reports coming out of North Korea seem to indicate that as well," Stephen Wood, vice president of DigitalGlobe's analysis center, told reporters in a news briefing today (April 11). North Korea has maintained that the impending launch is part of its peaceful space program, but many nations have openly condemned the move, claiming it is a missile test in disguise. Officials from the United States and South Korea have said that if North Korea proceeds with the Unha-3 launch, it could carry serious consequences and jeopardize foreign relations. The DigitalGlobe images show the launch pad, umbilical tower, fueling facilities, and adjacent vertical engine test stand. Other views offer a glimpse of the highly secure launch site's vehicle processing buildings, assembly facilities and mission control building. Based on the recent photos, Wood and his colleagues think the Unha-3 rocket is fully assembled on the launch pad, and that fueling of the booster has begun, which is also consistent with state media reports. "The launch tower has environmental covers or taps that are often draped around the arms that protect the rocket while it's vertically erected on the pad to protect it from the weather, as well as if they need to, conceal it," Wood said. "We believe the rocket is on the pad right now. From a bird's eye view perspective, it's largely being obscured and concealed because of the arms and cover around it." The Unha-3 rocket is nearly 100 feet tall (30 meters), according to press reports, and will lift off from the new Tongchang-ri launch site. Observations of activity around the launch pad suggest that fueling of the rocket has begun, which could indicate that North Korea will make their first launch attempt very soon. According to state officials, the Unha-3 rocket launch is scheduled to coincide with centenary celebrations of the birth of Kim Il Sung, who helped establish North Korea in 1948. While the satellite images cannot provide confirmation of a more precise launch date or time, DigitalGlobe analysts say that weather is likely the only prohibiting factor at the moment. "They tend to keep to their commitments unless weather interferes," Bermudez said. "The odds are they will try to go to the earlier portion of that range for a variety of reasons, and we believe that they're keeping a close eye on the weather, so weather will be a major indicator as to when they will launch." 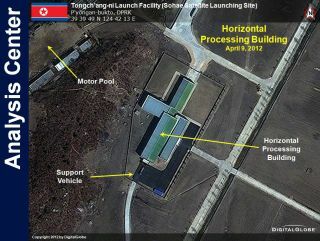 "The imagery cannot tell the difference between a satellite and a missile launch at this time," Bermudez said. "What you do to change a satellite launch vehicle into a ballistic missile — you make changes, obviously, to the payload, to the payload package, and what the payload rides on, the guidance system and a few other changes. The technology is easily transferrable. It's almost identical." North Korea has made previous space launch attempts, including a similar satellite launch in April 2009 that state officials claimed was a success. U.S. intelligence, however, showed that the vehicle failed during ascent, which caused the rocket's second and third stages and the onboard satellite to plummet into the Pacific Ocean. But there is no way of knowing, at the moment, whether the impending Unha-3 launch will be more successful for North Korea, Bermudez said. "Satellite imagery can't tell us the answer," Bermudez said. "However, given the progress they've made in their three previous launches, in 1998, 2006 and 2009, they've demonstrated some very unique capabilities. They've all failed, but they've shown positive results in certain areas, which tends to lead one to conclude that they will be successful going forward. Whether they'll be completely successful with this launch, we simply don't know until they launch."